As the Head of Strings at the Birmingham Conservatoire, Louise Lansdown is very concerned with the unspoken hierarchy that can come about amongst students when they first arrive at college, dependent on their background, standard and levels of confidence and how as a conservatoire they aim to help the students redress the balance. She talks about what she feels students need to prepare for performances and auditions so that the professional world is not so terrifying for them and how they need to manage their expectations of themselves.Louise is a member of the Manchester based Pleyel Ensemble, a group that gives Chamber Music Recitals around the North West. Louise Lansdown was appointed Head of Strings at Birmingham Conservatoire in July 2012, after holding the position of Senior Lecturer in the School of Strings at the Royal Northern College of Music in Manchester from 2001-2012 and part-time teaching positions at the University of Manchester and Chetham’s School of Music. She was awarded a PhD from the University of Manchester in 2008. 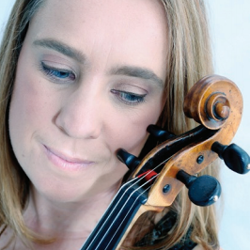 She is the founder and President of the British Viola Society, secretary of the International Viola Society and has delivered papers at viola congresses around the world. She is the Director of Chamber Music at Pro Corda and was on the jury of the Fifth Melbourne International Chamber Music Competition in 2007. Louise is a member of the Manchester based Pleyel Ensemble, a group that gives Chamber Music Recitals around the North West.